(JOE)>> OF ALL THE ENGINES WE'VE BUILT HERE ON HORSEPOWER, THIS OLDS 455 WILL ALWAYS BE A TRIBUTE TO THE ENGINE BUILDING ICON WHO HELPED US PUT IT TOGETHER. 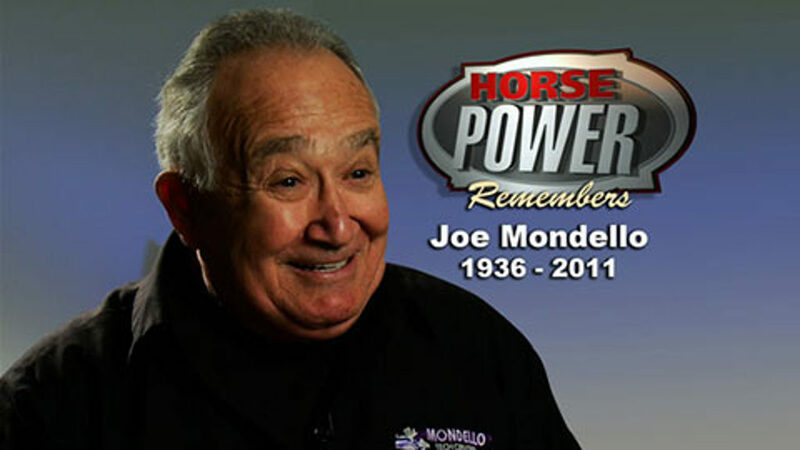 WE ALL LOST A TRUE LEGEND WITH THE RECENT PASSING OF JOE MONDELLO. SO WE'RE DEDICATING THIS ENTIRE SHOW TO HIS MEMORY, SHARING OUR SPECIAL MEMORIES WITH THE MAN KNOWN AS DOCTOR OLDS. (COURTNEY)>> WE'RE BACK ON POWERBLOCK WITH A QUESTION. 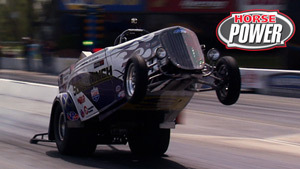 WHAT DO AJ FOYT, CARROLL SHELBY, DON GARLITS, JOHN FORCE, AND SMOKEY YUNICK ALL HAVE IN COMMON? THE ANSWER IS THIS MAN RIGHT HERE, JOE MONDELLO, THE OLDS DOCTOR. (JOE)>> IT WAS A POWERBLOCK APPEARANCE WITH COURTNEY BACK IN 2006 WHEN WE FIRST MET JOE MONDELLO. I'VE GOT TO ADMIT IT, I WAS A LITTLE NERVOUS GIVING THIS ICON A TOUR OF OUR HORSEPOWER SHOP. LITTLE DID MIKE AND I KNOW THAT A FEW YEARS LATER WE'D GO TO HIS SHOP FOR AN OLDS 455 BUILD. AN UNFORGETTABLE EXPERIENCE WITH AN UNFORGETTABLE LEGEND. (JOE M.)>> THE ONLY PLACE YOU FIND A HELPING HAND IS AT THE END OF YOUR OWN WRIST. NO FREE LUNCHES, THERE'S NOTHING FOR NOTHING, NO ONE'S GONNA HAND YOU ANYTHING, AND NOBODY'S GONNA MAKE YOU FAMOUS. YOU'VE GOT TO MAKE YOURSELF FAMOUS. (JOE)>> IT'S THAT KIND OF WORK ETHIC THAT MADE JOE MONDELLO FAMOUS AS A RACER, ENGINE BUILDER, AND TECHNICAL INNOVATOR. DRIVING HIS WAY TO COMP ELIMINATOR CHAMPIONSHIPS IN THE '60'S, JOE ALSO HAD THE DRIVE TO DESIGN BETTER WAYS TO MAKE ENGINE HORSEPOWER. BY THE 1970'S ALL KINDS OF RACE CARS WERE RUNNING AND WINNING THANKS TO HIS INNOVATIVE CYLINDER HEADS. (JOE M.)>> HORSEPOWER IS LIMITED BY THE AMOUNT OF AIR THAT CAN PASS THROUGH THE CYLINDER HEAD. THAT IS THE CONTROLLING FACTOR, PERIOD, END OF STORY, AND THAT'S THE WAY THAT WORKS. (JOE)>> IN 1968 MONDELLO STARTED RACING FOR OLDSMOBILE WHILE ALSO DEVELOPING SPECIALTY ENGINE PARTS FOR THEIR 455 BIG BLOCK. HENCE THE NAME DOCTOR OLDS. (JOE M.)>> THEY'RE JUST SELF DRIVEN AIR PUMPS. BUT WHEN YOU DO REALLY GOOD CYLINDER HEADS ON THEM, NOW THEY'RE DYNAMICALLY DRIVER. (JOE)>> DOCTOR OLDS IS NOW A MEMBER OF FIVE HALLS OF FAME. AND WITH A LEGACY LIKE THAT, HE COULD EASILY REST ON HIS LAURELS, BUT YEARS AGO A MISSION EMERGED. (JOE M.)>> THE LADY THAT YOU MET TODAY, MARY MONDELLO, SAID JOE, I WANT YOU TO START TEACHING PEOPLE WHAT YOU KNOW BECAUSE WHEN YOU DIE IT'S ALL GONNA GO IN THE BOX WITH YOU. (MARY)>> SO WE DECIDED TO OPEN A ONE WEEK CLASS. HE USED TO SAY LEARN 40 YEARS IN A WEEK, AND HE TRIED TO CRAM IT ALL IN TOO. (JOE M.)>> TURNING OUT GOOD, GOT GREAT GRINDER CONTROL. GET AROUND THAT FRONT PART OF THAT GUIDE A LITTLE BIT BETTER. YOU WALK IN THE FRONT DOOR, YOU'RE AN ENGINE ASSEMBLER. WHEN YOU LEAVE ON FRIDAY YOU'RE AN ENGINE BUILDER. (JOE)>> BIG DIFFERENCE. (JOE M.)>> THAT'S THE DIFFERENCE. 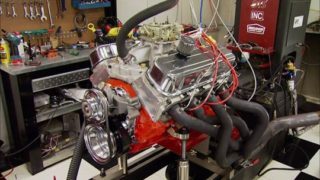 (JOE)>> BEFORE WE COULD APPLY MONDELLO'S MAGIC TO OUR OWN 455 BUILD, WE HAD TO FIND A DECENT USED BLOCK AND WE WERE PRETTY SURE ONE WAS WAITING UNDER THIS MOTOR WE BOUGHT FOR A FEW HUNDRED BUCKS. SO AFTER A COMPLETE TEAR DOWN AND DISPLACING A FAMILY OF BROWN RECLUSE SPIDERS, WE HAD THE FOUNDATION FOR A TRUE CLASSIC MOTOR CREATION. (MIKE)>> AFTER CLEANING AND MAGNAFLUXING THE BLOCK, WE'RE READY TO START THE MACHINING PROCESS. NOW HERE AT THE TECH CENTER THEY'VE GOT ALL THE LATEST EQUIPMENT, AND THE GUYS THAT USE IT, WELL THEY WERE TRAINED BY MONDELLO HIMSELF. SO YOU KNOW EVERYTHING'S GONNA BE DONE RIGHT THE FIRST TIME. AFTER CUTTING THE MAIN CAPS TO SHRINK THE BORES ABOUT A THOUSANDTH, THE FIRST MAJOR STEP IS TO LINE HONE THE BLOCK TO MAKE SURE THE MAINS ARE ROUND AND STRAIGHT. THEN BRETT LOADS OUR BLOCK IN AN RNC BLOCK SURFACER. FIRST THE MACHINE HAS TO PROBE THE BLOCK TO LEARN WHERE THE HOLES ARE. THEN IT TAKES OUT 30 THOUSANDTHS FROM EACH CYLINDER BEFORE THE INITIAL PASS OF SURFACING. (BRET)>> DECK SURFACES WERE NOT SQUARE THIS WAY, AND YOU CAN SEE BEING THAT IT TOUCHED HERE AND NOT HERE, THAT IT WASN'T SQUARE THIS WAY. ALSO YOU'RE SEEING HOW UNFLAT THE DECK SURFACE WAS IN THE HIGH SPOTS AND THE LOW SPOTS THERE. (MIKE)>> AFTER SEVERAL PASSES, THE MACHINE HAS TAKEN OFF ABOUT 13 THOUSANDTHS OF SURFACE MATERIAL. THEN DAVID AND HIS SUNNEN SV 10 TAKE OVER TO HONE OUT THE CYLINDER BORES TO MAKE THEM PERFECTLY ROUND WITH THE CROSS HATCH TO ALLOW THE RINGS TO SEAT PROPERLY. (DAVID)>> THAT'S PRETTY MUCH TELLING YOU A BASIC IDEA OF WHAT THE BORE'S LOOKING LIKE. 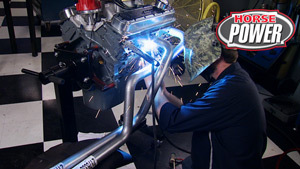 (MIKE)>> WE'RE REUSING THE STOCK RODS BUT ONLY AFTER BRET RESIZES THEM WITH NEW ARP BOLTS. THE STOCK CRANK SHAFT'S IN PRETTY GOOD SHAPE, BUT DAVID WILL NEED TO DO A LITTLE DRILLING TO BRING IT INTO PERFECT BALANCE. THEN A LITTLE POLISH ON THE JOURNALS AND THE CRANK'S READY TO GO IN. 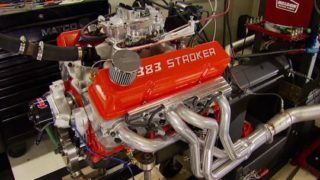 (JOE)>> IT'S ABOUT TIME FOR THE MASTER ENGINE BUILDER HIMSELF TO TAKE OVER, AND HE'S GOT A BACK FULL OF TRICKS AND TECH GEMS THAT'LL MAKE ANY MOTOR LAST LONGER AND MAKE MORE POWER. 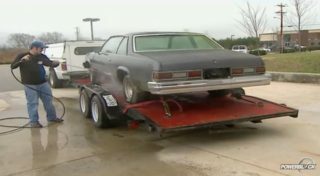 (JOE)>> WE SET OUT TO BUILD A PIECE OF HORSEPOWER HISTORY, THE OLDS 455. BY FIRST TEARING DOWN A BONEYARD BEAST TO RENDER A USEABLE BOTTOM END. AND WE TOOK THE BLOCK TO JOE MONDELLO'S TECH CENTER FOR A COMPLETE MACHINING, HAD THE CRANK BALANCED, AND THE STOCK RODS RESIZED FOR USE WITH NEW SPEED PRO PISTONS. NOW IT'S TIME FOR DOCTOR OLDS HIMSELF TO STEP IN FOR HIS BASIC CLEAN UP PORTING OF OUR EDELBROCK PERFORMER RPM HEADS. (JOE M.)>> THE BIGGEST THING ABOUT DOING THESE HEADS IS MASTERING THIS GRINDER, CAUSE THE GRINDER GETS AWAY FROM PEOPLE. YOU'VE GOTTA HAVE GRINDER CONTROL. YOU OWN THE GRINDER, IT DOESN'T OWN YOU. (MIKE)>> NO DOUBT WHO'S IN CHARGE OF THE GRINDER HERE, AND AFTER ROUGHING OUT THE SHORT SIDE RADIUS, TIME FOR A LITTLE POLISH. AND HERE MONDELLO USES A CREATION OF HIS OWN CALLED A FLAPPER STICK. (JOE M.)>> IT LEAVES ONE CONSISTENT TEXTURE IN THE PORT, WHICH HELPS TO HAVE A MUCH MORE BETTER HOMOGONOUS FUEL MIXTURE AND A LOT BETTER STRATOLAYER OF INCOMING FUEL IN THE PORT RUNNER. (JOE)>> OUR HEADS ARE ALSO TREATED TO A BASIC VALVE JOB TO MAKE SURE THE VALVES SEAL TO THE COMBUSTION CHAMBERS, BUT THAT'S NOT THE ONLY REASON. (BRET)>> THE DIFFERENT ANGLES ON THE VALVE SEAT ARE GOING TO CHANGE THE WET FLOW CHARACTERISTICS AND THE DRY FLOW CHARACTERISTICS OF A CYLINDER HEAD. WHAT WE'RE DOING HERE IS PRESSURE TESTING THE SEAT TO MAKE SURE IT'S SEALING PROPERLY. SEE WE'RE WELL INTO THE GREEN HERE AT POINT EIGHT. (MIKE)>> BACK IN THE PORTING ROOM, MONDELLO METICULOUSLY DEBURRS THE BLOCK TO ELIMINATE THE SMALLEST POSSIBLE OBSTRUCTION OF OIL FLOW, LIKE HERE SMOOTHING OUT AN OIL HOLE THAT LUBRICATES THE TIMING CHAIN. (JOE M.)>> DONE! (MIKE)>> HE EVEN GOES INTO THE WATER JACKETS TO CLEAN OUT THE RUST AND CALCIUM. (JOE M.)>> BY GETTING IN THERE WITH THIS THING AND CLEANING IT UP, ENGINE RUNS COOLER THROUGH BREAK IN AND COOLER THROUGH THE WHOLE LIFE OF THE ENGINE. (JOE)>> HEY, BEFORE WE START BUILDING UP OUR BOTTOM END, I WANT YOU TO MEET THE REAL BOSS OF THE TECH CENTER. THIS IS THE CISCO KID. HE'S DRESSED FOR SPEED AND BORN TO RUN. MEANWHILE I THINK THE DOCTOR'S READY TO OPERATE. AND THE FIRST OR PROCEDURE IS TO KNOCK IN THE NEW CAM BEARINGS. BEFORE ANYTHING ELSE HAPPENS, JOE INSTALLS THE REAR MAIN TO MEASURE IT WITH A GAUGE. HEY CHECK OUT THE TOOL HE INVENTED FOR GETTING THE MAIN BACK OFF. 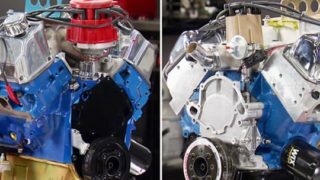 MONDELLO SPEND YEARS COMING UP WITH INNOVATIONS THAT IMPROVE THE OLDSMOBILE ENGINE'S NOTORIOUS OIL RETURN ISSUES. WELL LIKE THE FOUR OIL RESTRICTORS HE PUTS INTO THE MAINS. (JOE M.)>> IT KEEPS MORE OIL DOWN IN THE MAIN BEARINGS AND AROUND THE ROD BEARINGS BECAUSE OF THE LARGE CAPACITY OF OIL FLOW. 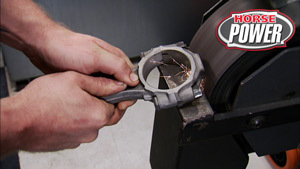 (JOE)>> OF COURSE YOU HAVE TO MODIFY THE MAIN BEARINGS IN ORDER FOR THE RESTRICTORS TO WORK. IN GOES THE CAM NOW, WHICH BY THE WAY IS A COMP HYDRAULIC ROLLER WITH THEIR SPECIAL PRO PLASMA NITRITE TREATMENT. (MIKE)>> NEXT INSTALLING SPECIAL FRONT AND BACK OIL GALLEY PLUGS. (JOE M.)>> MAKE SURE THAT THE OIL GALLEY PLUG IN THE BACK HAS GOT A 40 THOUSANDTHS OILING HOLE IN IT. IF IT'S A THREEEIGHTHS PIPE PLUG YOU WILL BURN UP THE CAM AND YOU WILL BURN UP THE DISTRIBUTOR GEAR GUARANTEED. (MIKE)>> NOW THE CRANK SHAFT CAN GO IN ALONG WITH MAIN CAPS AND ARP BOLTS. THEN USING A FEELER GAUGES, YOU MAKE SURE THRUST IS BETWEEN SIX AND 12 THOUSANDTHS. (JOE M.)>> IT'S A SIX. OKAY, CHECK THE TOP AND ALSO CHECK THE BOTTOM. (MIKE)>> NEXT HE PULLS THE CRANK FORWARD TO TIGHTEN THE BOLTS BEFORE TORQING. (JOE M.)>> 90 POUNDS WITH MOLY. 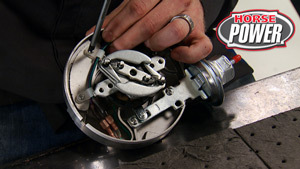 (MIKE)>> JOE USES TIMING GEARS THAT CHANGE THE OLDS FROM A SLIP FIT TO A PRESS FIT SETUP. (JOE)>> IT'S PLAIN TO SEE THAT MONDELLO DOESN'T USE ANY PART RIGHT OUT OF THE BOX. THAT DEFINITELY GOES FOR PISTON RINGS. AFTER PRECISELY CHECKING THE END GAPS AND IN MANY CASES GRINDING THEM DOWN A LITTLE, HE USES A SPECIAL STONE TO SMOOTH OUT THE SHARP EDGES. (JOE M.)>> THE BIGGEST SCRATCHES IN A CYLINDER BORE ARE THE SHARP EDGES ON THESE ORINGS. THIS SIDE IS FOR OPENING AND CLOSING OF VENTS. THIS SIDE OVER HERE IS FOR INTAKE CENTER LINE. (JOE)>> MONDELLO'S A STRONG ADVOCATE OF DEGREEING THE CAM AT FOUR CYLINDERS, TWO ON THE RIGHT BANK AND TWO ON THE LEFT. (JOE M.)>> IF YOU DEGREE A CAM SHAFT, YOU HAVE WORKED ON THE HEART OF THE ENGINE. IF THE CAM TIMING'S RIGHT, EVERYTHING ELSE WILL FALL IN PLACE. (MIKE)>> AFTER INSTALLING THE OIL PUMP AND PICK UP, WE'LL BE GOOD TO GO AND FINISH THE BUILD BACK HOME AT OUR SHOP. (JOE)>> MEANWHILE IT WAS MESMERIZING TO SPEND A COUPLE OF DAYS WITH THIS ICON OF ENGINE BUILDING STILL GOING STRONG AFTER 50 YEARS OF HIGH PERFORMANCE PERFECTION. (JOE M.)>> THE QUESTION'S ALWAYS ASKED OF MY WIFE, WHEN'S JOE GONNA RETIRE? JOE'S NOT GONNA RETIRE. WE'RE GONNA HAVE THE FUNERAL AND THE RETIREMENT PARTY THE SAME DAY. SO SHOW UP, THAT'S THE WAY IT'S GONNA WORK. (JOE)>> WELL AFTER A VISIT WITH THE OLDS GURU, IT WAS OUR TURN TO FINISH A CLASSIC 455. 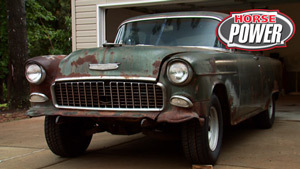 (MIKE)>> OUR ORIGINAL GOAL WAS TO SALVAGE AS MANY ORIGINAL PARTS AS POSSIBLE, INCLUDING THIS FRONT COVER. NOW ONCE WE GET THIS THING ON, WE CAN BUTTON UP THE BOTTOM END. THEN AFTER LAYING A BEAD OF SILICONE DOWN, WE CAN PUT OUR FRONT AND REAR SEALS IN PLACE. (JOE)>> NEXT WE CAN LAY OUR MISTER GASKET ULTRA SEALS IN PLACE AND DROP ON THE OIL PAN, WHICH IS A SEVEN QUART PAN MADE BY MOROSO FOR THE 455. 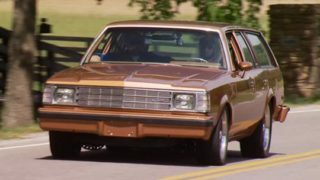 BEFORE ANYTHING ELSE THOUGH, MIKE'S GONNA PAINT THIS MOTOR'S BOTTOM AND GIVE IT A TOUCH OF NOSTALGIA, CLASSIC OLDS GOLD OF COURSE. 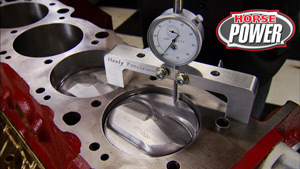 IF YOU SAW OUR SHOW A COUPLE WEEKS AGO, YOU CAUGHT A GLIMPSE OF THESE EDELBROCK PERFORMER RPM HEADS FOR THE 455. THEY'VE GOT COMBUSTION CHAMBERS THAT SPEC OUT AT 77cc'S. VALVES ARE 219, 188, AND WELL THESE THINGS MAKE REALLY GOOD POWER RIGHT OUT OF THE BOX. BUT AS WE SAW AT MONDELLO'S PLACE, THERE'S ALWAYS ROOM FOR IMPROVEMENT. THESE GUYS DON'T ALLOW ANY HEADS TO LEAVE THE BUILDING WITHOUT A LITTLE TWEAKING, ROUGHING OUT THE COMBUSTION CHAMBER VALVE POCKETS IN OUR CASE, AND POLISHING THEM TO A SMOOTH FINISHED SURFACE. GASKET'S ON AND SO'S THE HEAD. SINCE THESE BOLT HOLES ARE BLIND, WE JUST NEED A LITTLE BIT OF ARP ASSEMBLY LUBE ON THE THREADS OF THESE BOLTS. (MIKE)>> HERE'S AN IMPORTANT LITTLE PIECE YOU DON'T WANT TO LEAVE OUT ON THESE OLDSMOBILES. IT'S A SPLASH GUARD THAT GOES DOWN IN THE LIFTER VALLEY. NOW WHAT IT DOES IS IT KEEPS ANY OIL FROM SPLASHING OFF OF THE CAM SHAFT ONTO THE BOTTOM OF THE INTAKE MANIFOLD. CAUSE WHAT THAT DOES IS IT HEATS UP THE INTAKE AND THE FUEL AND AIR COMING IN, AND ROBS HORSEPOWER. FOR ROCKERS WE'RE USING COMP'S ALUMINUM ULTRA GOLDS. NOW WE GOT OURS WITH A ONE POINT SIX RATIO. TO ADJUST THEM, WORK ONE CYLINDER AT A TIME WITH EACH LIFTER ON THE BASE CIRCLE OF THE CAM. TIGHTEN THE POLY LOCK UNTIL YOU GET ALL THE SLACK OUT WITH A LITTLE BIT OF RESISTANCE. NOW YOU'RE AT ZERO LASH. NEXT TURN THE POLY LOCK JUST UNDER A HALF TURN. NOW TIGHTEN THE SET SCREW AND USE THE THANDLE TO LOCK THEM DOWN INTO PLACE. THIS WILL GIVE YOU THE IDEAL PRELOAD TO THE ROCKER ARM, PUSH ROD, AND LIFT. 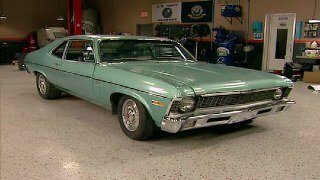 (JOE)>> THIS EDELBROCK PERFORMER'S A VAST IMPROVEMENT OVER THE CAST IRON ORIGINAL. IT'S A DUAL PLANE LOW RISE DESIGN, AND MADE TO GIVE YOU PLENTY OF TORQUE OVER A BROAD POWER RANGE WITH PLENTY OF THROTTLE RESPONSE FROM OFF IDLE TO 5,500 RPM. (MIKE)>> THEY RECOMMEND A QUARTER INCH BEAD OF SILICONE TO MAKE THE SEAL, AND THAT'S BECAUSE THE RUBBER AND CORK GASKETS, WELL THEY CAN GET OIL SOAKED. AND WHAT HAPPENS IS THE CRANK CASE PRESSURE FROM THE ENGINE WILL PUSH THE SEALS OUT FROM UNDER THE INTAKE MANIFOLD, AND THAT'S WHERE YOU GET INTO END SEAL SLIPPAGE. TAKE YOUR TIME WITH IT. YOU DON'T WANT TO HAVE TO DO IT TWICE. (JOE)>> THESE ROCKER ARMS MATCH OUR BLOCK SO MUCH I ALMOST HATE TO COVER THEM UP. (MIKE)>> TO FEED OUR OLDS WE'RE USING THIS SUMMIT 750 CFM SQUARE BORE FOUR BARREL. NOW THIS THING HAS MECHANICAL SECONDARIES AND A MANUAL CHOKE. NOW THIS IS THE SAME CARB WE USED ON OUR 460 FORD A WHILE BACK AND IT WORKED REALLY GOOD. SO NOW WE'RE GONNA SEE HOW IT DOES ON A MORE PERFORMANCE BASED PLATFORM. BREAKING IN A FLAT TAPPET CAM IS LIKE HEART SURGERY. DO IT RIGHT THE FIRST TIME AND YOU'LL AVOID A LOT OF PROBLEMS. NOW WE'RE RUNNING THE OLDS AT 2,000 RPM. (CHRIS)>> HOW LONG DOES THAT TAKE? (MIKE)>> 20 MINUTES! AND THEN STEPPING UP TO 2,500 FOR 10 MINUTES. HALLELUJAH, FINALLY! (CHRIS)>> IT SOUNDS PRETTY GOOD! 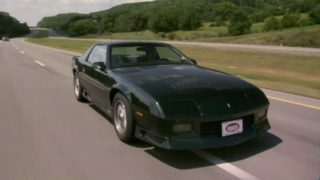 (MIKE)>> YEAH, MAN I'M REALLY, REALLY IMPRESSED AT THE THROTTLE RESPONSE OF IT. (CHRIS)>> IT DOES SOUND REALLY MEAN AT IDLE. (MIKE)>> I LOVE IT, JUST CHAGACHU. IT DANCES QUITE A BIT. SEE WE PRACTICE WHAT WE PREACH. RIGHT NOW WE'RE DRAINING THE BREAK IN OIL. THEN WE'LL FILL IT UP WITH SOME NEW. THEN WE'LL BE ABLE TO SEE HOW MUCH POWER OUR 455 SPINS OUT ON THE DYNO. BUT FIRST, YOU GUESSED IT, ANOTHER BREAK. SOMETHING AIN'T RIGHT. AH, HERE IT IS, THE CULPRIT. WE'VE GOT A VACUUM LINE WITH A SMALL HOLE IN IT, AND IT'S RIGHT AT THE OPENING OF THE CANISTER. SO IT'S NOT PULLING FULL VACUUM ON THE DISTRIBUTOR FOR THE ADVANCE. SO WE'LL CUT THIS THING SHORTER, FIX IT, AND HOPEFULLY MAKE MORE POWER. SO MUCH FOR HOPE, LETS TRY TO ADVANCE THE TIMING A BIT. RIGHT THERE! ABOUT THE SAME. IT'S MAKING 500 FOOT POUNDS OF TORQUE BUT THE POWER'S NOT THERE, ABOUT 330. HEY, WHEN YOU'RE SICK, YOU CALL THE DOC, AND HERE'S MONDELLO'S DIAGNOSIS. I WILL SWAP IT OUT. WHILE THE SUMMIT 750 IS GOOD, IT'S JUST NOT BIG ENOUGH FOR THIS MOTOR. SO ON WENT A HOLLEY 870 STREET AVENGER AND WE WERE READY FOR ANOTHER PULL. 376, TORQUE CAME DOWN, 463. (JOE)>> WE'RE RUNNING LEAN, SO TIME FOR BIGGER JETS. (CHRIS)>> THAT WAS ALREADY AN IMPROVEMENT. (MIKE)>> LETS LOOK AT THE GRAPH. (CHRIS)>> IT'S KINDA ALL OVER THE PLACE. (MIKE)>> YEAH MAN, THAT'S WILD! (JOE)>> CHAOS LIKE THIS POINTS TO THE DISTRIBUTOR. (MIKE)>> THEY USE A BUSHING, AND THEY WERE JUST SO TIGHT AGAINST THE ACTUAL WEIGHT THAT IT WAS STICKING SHUT. AND AS IT WENT UP THROUGH THE RPM RANGE, IT WASN'T ADVANCING PROPERLY. 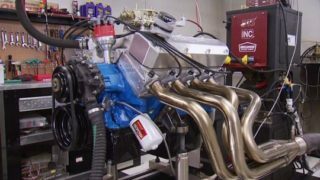 (MIKE)>> 525 FOOT POUNDS, 437 HORSEPOWER, THIS THING'S MAKING SOME BIG TORQUE NUMBERS. IT'S AN OLDSMOBILE THOUGH! (JOE)>> DON'T LET THE SMILE FOOL YOU. MIKE WON'T BE HAPPY UNTIL HE HITS THAT MAGIC 455 HORSEPOWER NUMBER. (MIKE)>> WE'RE SO CLOSE. REALLY SLOW, ALRIGHT, PERFECT! (JOE)>> BUT AFTER COUNTLESS RUNS, TIME HAS RUN OUT. (MIKE)>> YES, YES, YES, 456 HORSEPOWER. THAT'S THAT ONE HORSEPOWER PER CUBIC INCH. WE EVEN GOT 537 FOOT POUNDS OF TORQUE. NOW I THINK THE REASON THIS IS ALL HAPPENING IS BECAUSE OF THE DRY COOL AIR. MAN THIS IS COOL, NOW I'M HAPPY. (JOE)>> WE WERE ALL HAPPY TO HAVE WORKED ON THIS SUCCESSFUL 455 BUILD WITH GUIDANCE FROM THE GREAT JOE MONDELLO. HE WAS A HOT RODDING LEGEND WHO'LL BE GREATLY MISSED BUT ALWAYS REMEMBERED AS THE ONE AND ONLY DOCTOR OLDS. (JOE M.)>> THE QUESTION'S ALWAYS ASKED OF MY WIFE, WHEN'S JOE GONNA RETIRE? JOE'S NOT GONNA RETIRE. WE'RE GONNA HAVE THE FUNERAL AND RETIREMENT PARTY THE SAME DAY, SO SHOW UP! THAT'S THE WAY IT'S GONNA WORK!